Workshop for 2 groups of 18 students. Design Fiction cards by Changeist and Torch Normative is a worldbuilding tool that has a long-form gameplay and produces a rich scenario. It consists of five types of trend/driver cards (STEEP) and four context cards (organisation, mission, constraint and target user). 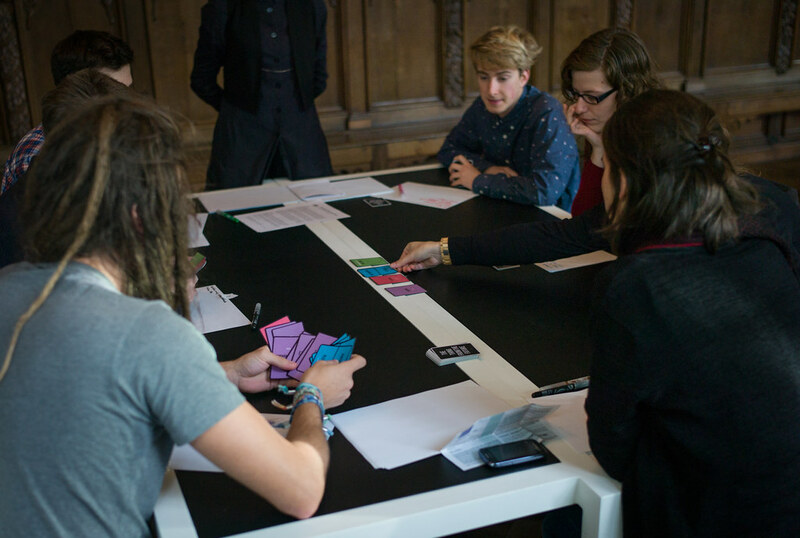 The game invites the participants to think broadly to design a world in which they then work on a design challenge. The Thing From the Future by the Situation Lab is most 'gamelike' of the three decks as it has a competitive aspect: at the end of the game there is a 'winner'. It is also the only deck that invites a mixture of group and individual creation. The game works with four generic futures (grow, collapse, discipline and transform) with different time horizons (up to 1000 year). The futures are further specified with 'terrain', 'object' and 'mood' cards, giving a specific context for creating 'the thing' from that future. It is played in several rounds until the deck is exhausted (or until the time runs out). 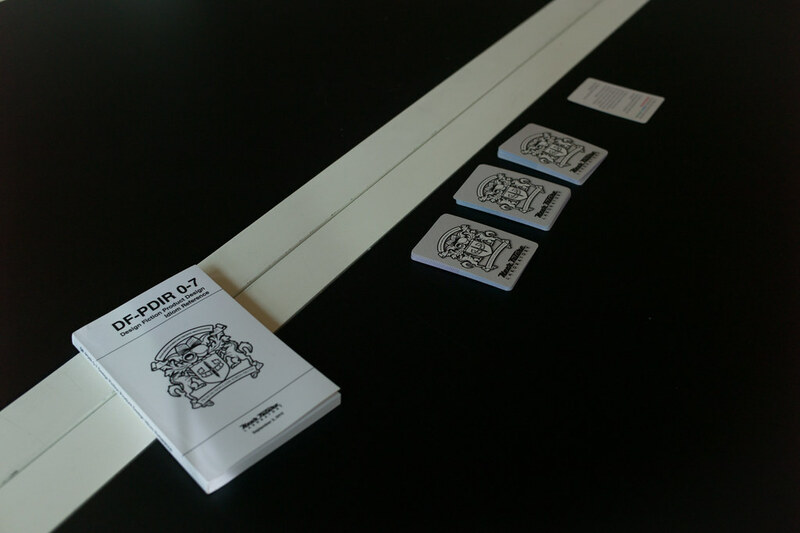 The Design Fiction Kit by the Near Future Lab has the quickest gameplay of the three decks with simplest instructions. 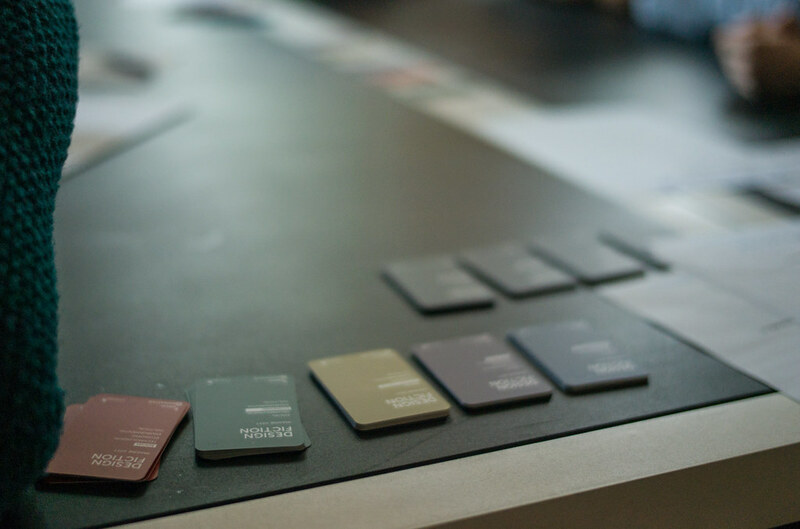 The goal is to design specific products for the near future based on three cards describing an object, an attribute and design action. The products are described, visualised and given a name, as they would appear in a product catalogue. Changeist’s Design Fiction produced two worlds and two 'solutions' developed within those worlds. One group worked with a world plagued by heavy weather and biological determinism, which lead to a need for anonymity and an increase in xenophobia. They formed an internet company with the constraint that they could not use the internet and mobile technology, working with rural populations to change their perception of work. The world was fragmented in family/clan sized villages separated by water. They were rather self sufficient, but required an 'off-line' internet (the online infrastructure collapsed), to exchange goods and information. The company created 'internet hubs' a physical version of the internet with human and non-human messengers and couriers who kept the exchange of material goods and immaterial knowledge alive. The second group developed a world suffering from cognitive pollution, flex working and distributed education, in a relatively stable climate. They were an organisation creating infrastructure and built environment, with a mission to connect children through free education and leisure. They created a protected off-line park where learning and play happened through connections with other children, where they could build on each others’ skills and knowledge to create complex projects as well as learn basics of maths, sciences and humanities. The park also included leisure spaces, which were accessible by exchanging credits gained in gamified educational courses and projects. The Near Future Lab’s Design Fiction Kit produced a total of twelve objects (across two groups). The objects included a range of devices from a future that appeared mostly familiar with a few peculiar edges. HD sunglasses changing their focal length and darkness as required. Changeist’s Design Fiction worldbuilding exercise appeared to be quite complex, and most students found it difficult to begin with. It took them a while to understand the nature and detail of the concepts described and the process of elaboration. They often struggled to keep the content of all cards in mind and tended to work with a subset of the issues. Early dicussions tended to close down the exploration of possibilities, however questions about explicitly linking or cross checking cards with emerging ideas tended to open up the conversation. However, once it 'clicked' discussions became much deeper and more reflective than those within the other two games. The cards provided a lot of material to work with and the first group felt that they should have had more time to develop it. For this game it might be necessary to either play with people who have a bit more experience with the foresight process, have a longer introduction, or have a facilitator present at all times to moderate and guide the discussions. 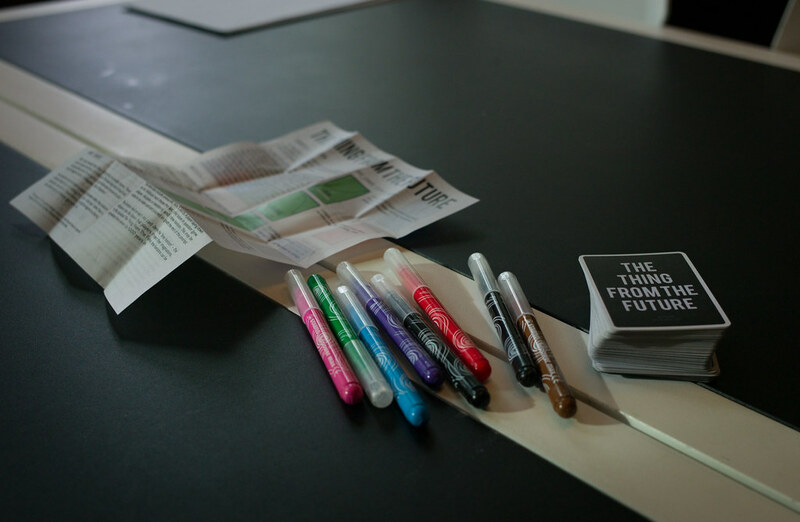 Near Future Lab’s Design Fiction Kit is simple, but perhaps deceptively simple since it requires (assumes?) a reasonable understanding of the (product) design process to avoid falling into cliches. Several students with a background in design found the rapid development and rejection of ideas more manageable than those who were more careful or those considering unexpected implications. One group took a while to understand what they were doing and needed continuous prompting from the facilitator to develop the objects further. The other was quick to understand the process and could create and discarding ideas at a faster pace but occasionally overlooked some cards. The ideas generally came to life if there was someone in the group who could illustrate them. One group had a few more people able to draw and created 'pages of a product catalogue' inspired by the TBD catalogue. This created a more lively process than when ideas were just named and described. The reference book wasn’t used much in either group. We have a sense that some of the gentle absurdity of the reference might be a lost with non-native speakers. Situation Lab’s Thing from the Future took a while to explain, since it needed an introduction to 'generic futures', the rules of gameplay and the procedure for voting on the best idea in each round. However, once the instructions were understood and a quick dry-run round was played, the groups needed virtually no supervision, except for time keeping and coming up with an 'anonymous' voting system (they were too timid to outright vote one idea better than another, so we gave them pieces of paper on which they wrote a number of the idea they liked (1-6 starting with the person who presented their idea first). They folded the papers and gave them to the dealer or facilitator who unfolded them and pronounced the winner. We had a draw twice, in which case we divided the cards evenly between two people. 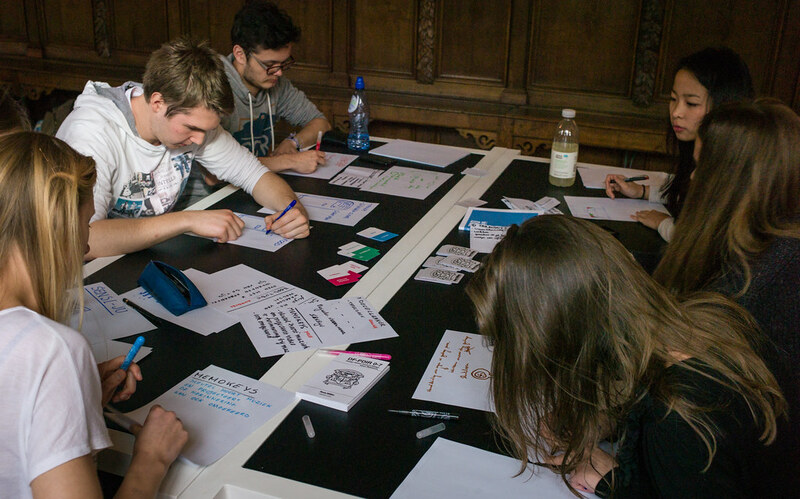 Participants also most appreciated that they could take time to come up with individual ideas, rather than having to discuss them in the group. 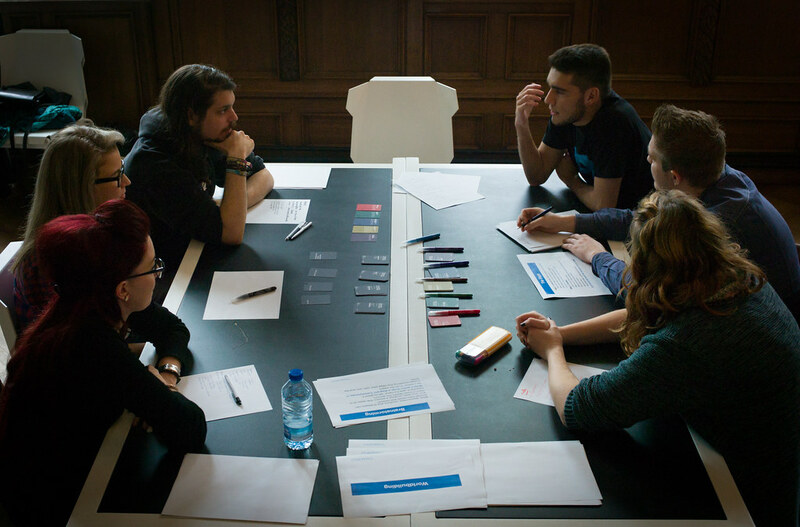 As we still wanted to encourage a creative group discussion, after three rounds we added some 'visualisation time', where the whole group could develop the winning idea further, visualise it and add a heading or slogan to describe it. Having several different decks is a good way of getting an idea of the various approaches to futures exercises. 1h30 is too short to let all the groups experience all the games, but we would suggest that the participants try at least two games. In this case the workshop would need to be longer, 2~3h with a break between the games. Some groups felt that they needed more time for gameplay and visualisation some felt it went on too long. As facilitators we felt a playing session of 45 minutes was sufficient and depending on the groups more time may be needed for reflection, presentation and discussion. 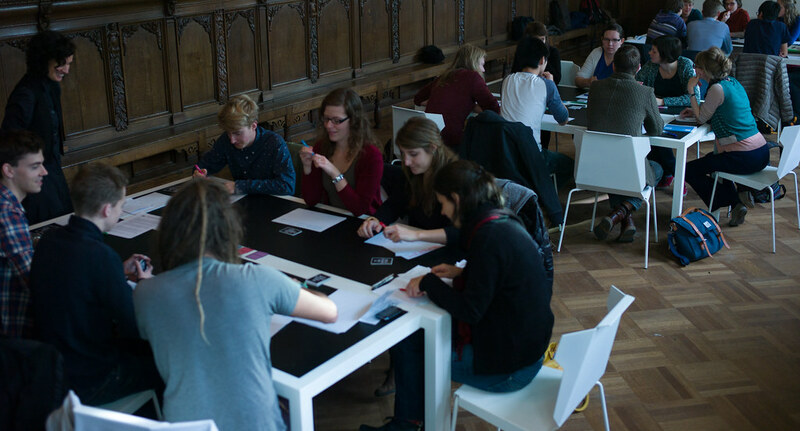 In this workshop it was important for each table to consist of two groups of three students with whom they would work for the rest of the week. this would allow the trios to get to know each other and begin their co-creation process together. We had thought that it might have been interesting to split the trios and let each of the members try a different game, so that when they came together they would be familiar with a full set of futures approaches in this workshop. It was surprising to see that drawing wasn’t a common skill in design/arts/architecture students. It might have helped to have some printed images to help with visualising their ideas with collages or moodboards. We struggled to get all the groups going at the same time with two facilitators and three games. Although we provided written instructions by the authors of the games, the participants in all cases needed us to talk them through the process. It might have been a language issue, but in case it isn’t then we’d recommend to have as many facilitators as there are games. This was an interesting, low overhead way to introduce participants to creative futures processes and to let them get to know each other as people with diverse ideas. As a workshop it is definitely worth doing again.